Just submitted WordPress.org one of my recent plugins. I thought I should have the plugins in WordPress repository too. I will post a link to it soon, once its approved of course. Here is a little description of how this plugin works. 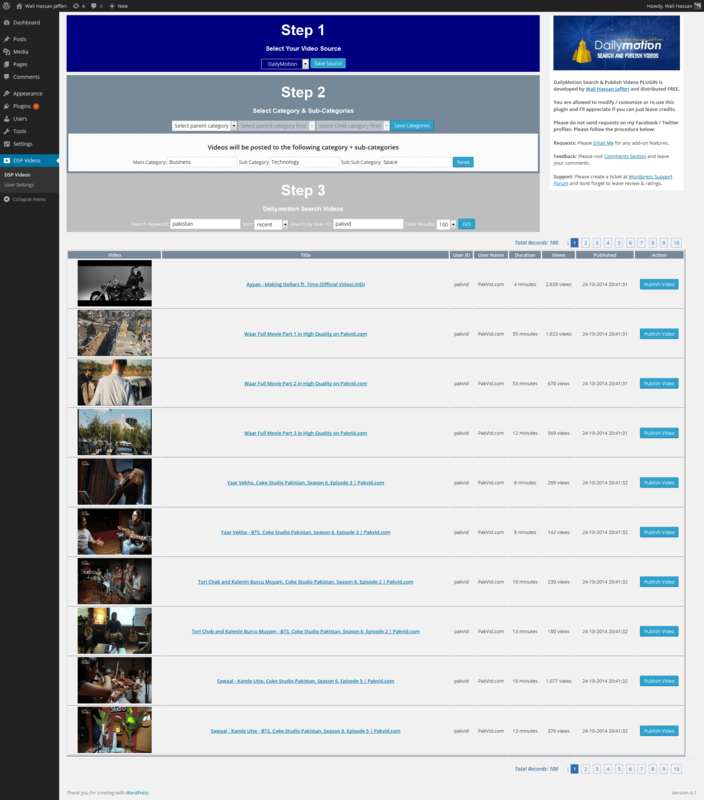 This is a standalone plugin that offers Dailymotion Video Search right from your WordPress Dashboard. The plugin uses Dailymotion Graph API (json) to search videos and ofcourse its Fast and Efficient to what it does. You can use any search keyword and search either Recent or Relevant videos from Dailymotion. This plugin will automatically pull your categories upto 3 levels. You can then save Videos in these categories. A video Post will add the following to your post. 3. Video Thumbnail automatically set as Featured image of your post. 4. Video Embed HTML code automatically inserted in your Post content. 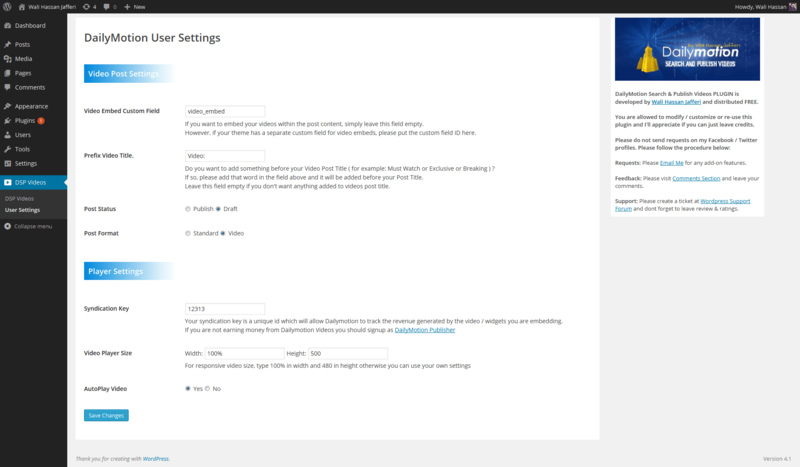 Once video is published, you will get a link to EDIT right on plugin dashboard. The Version 2.5.1 Released: January 30th, 2015. Youtube & Vimeo coming soon option enabled. You can give the password if you wish to understand the problem as the site of the panel in full için.eklent I want but I can not. whats your URL? did you try updating latest version? Where i can get Syndication Key? it API Key & API Secret??? Dailymotion has changed a bit now and may be you don’t need syndication key. You need to add your website in your Account for monetization and that will take care of it. Try selecting ” Do not show play er control settings” and see if that works? I think its a bug and its working opposite which means if you select SHOW it will hide, if you HIDE, it will show. It probably has something to do with recent changes in Dailymotion API. I will fix it in plugin and push it with next plugin update. Thank you for pointing it out. You can reset categories but for User Settings there is no Reset button. You manually have to reset them one by one.